Who wants cake? Certainly not treatment plant operators who employ microfiltration and ultrafiltration membranes, and here’s what they’re doing about it. The increasing desirability of microfiltration (MF) and ultrafiltration (UF) membrane systems over conventional water treatment plants is a direct result of their continued success in effectively reducing turbidity, rejecting pathogens and coagulated materials, and, in general, separating particulates from a sourced feedwater. Increasingly, MF and UF are the processes of choice for customers installing new water treatment systems and retrofitting or upgrading older, conventional plants. Both MF and UF membranes rely on distinct pore sizes to physically reject specific particles. Pore sizes vary deliberately, with MF membranes having relatively larger pores in the range of 0.1 to 0.2 microns and UF having smaller pores in the range of 0.005 to 0.01 microns. If the membranes have not been compromised, they will effectively reject any particle larger than the pore dimension. When the larger particulates are unable to pass through the membranes, they build up and can potentially become pinned to the membrane surface, developing into what is known in the industry as a “filter cake.” If left unchecked, this cake will become thicker and thicker as more particulates bind to it. The resulting layer may become so dense that flow to the membranes is inhibited and an increased feed pressure is required to overcome the barrier and effectively pass water through the membranes. When that occurs, the surface of the membranes must be cleaned or treated in some manner to restore the flow of water through the membrane. There are several methods of cleaning MF/UF membrane surfaces. In most applications, the cleaning process includes a backwash — a method of applying short bursts of filtrate water from the opposite direction of the feed flow to help dislodge the filter cake and direct particulates away from the membranes and out of the system. An air scour may also be applied to increase the efficacy in dislodging particulates from the membrane surface. Enhanced chemical backwash and clean-in-place (CIP) cycles take these steps further by introducing some type of chemical to help disperse, dissolve, and remove accumulated solids and restore system performance. Any maintenance process that extends the time between backwash or chemical cleaning is a commercial advantage in reducing operating costs and increasing system efficiency. The numerous benefits of membrane bioreactors (MBRs) for wastewater treatment have resulted in a growing number of new installations. MBR systems apply MF or UF membranes depending on the system’s design and application. This process treats biosolids and provides a higher-quality filtrate with a system that typically has a much smaller footprint than a conventional plant. 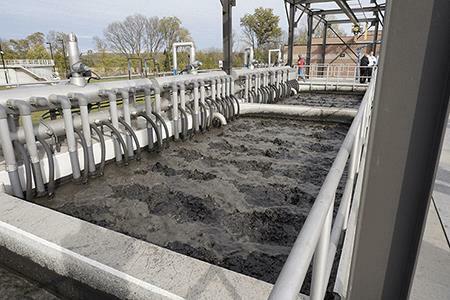 The membranes are submerged in a mixed biosolids liquor, and the filtrate is drawn through the membrane. Biosolids, bacteria, and some viruses are unable to pass through the membrane’s pores and remain in the mixed liquor. Because the feed flow is directed toward the MBR membranes while water is drawn from the mixed liquor to the membrane surface, particulates and solids inevitably accumulate. Combine this process flow with the extremely high solids content common to most MBR feedwaters, and the resulting issues related to filter cakes can be especially significant. Backwashing is not typically applied to MBR systems, as the particulate loading in the mixed liquors is simply too high to be effective. Instead, system operators apply intense agitation and circulation of the liquor to help minimize solids accumulation. There is also a procedure referred to as the “relaxation” step in which the draw from the mixed liquor is halted for a designated time while the agitation continues. Ideally, this reduces the depth of the filter cake on the membrane’s surface. Air is introduced for scouring the membrane surface. A cassette is lifted from the MBR process to clean off solids. The most common method to keep membrane surfaces clean and active is to sparge air across the membrane, allowing the resulting air bubbles to dislodge particulates from the surface and thin the foulant layer. It’s possible to manipulate the size of the bubbles, and one industry manufacturer has determined that smaller bubbles are more advantageous for its systems. Introducing a continuous barrage of air requires energy, however, and the resulting cost can become significant in the overall operating cost. To help mitigate the energy cost, another MBR supplier has developed a process that generates random bursts or pulses of air, so that the resulting bubbles are not applied in a continuous stream. The MemPulse® MBR offers a random, rapid pulse of air up the membrane fiber column without any moving parts or valves to control the pulse, providing a constant flow of air to the equipment. In addition to scouring the membrane surface, the subsequent turbulence creates a flotation effect that helps move grease, oil, and other floating particulates to the top of the fiber bundles where they can be minimized or removed. Human hair has proven to be particularly challenging for wastewater treatment systems, especially those that employ hollow fiber membranes. Hair does not readily dissolve, and lengthy strands are strong enough to wind around and damage membrane fibers. Recent system designs have addressed this challenge with components that overcome the buildup of hair and other fibrous materials that plagued early MBRs. Eliminating this unique risk helps reduce operating costs and mitigates the unsavory task of disconnecting membrane cassettes to remove materials by hand. The evolution of hollow fiber technology began with manufacturers potting fibers at both ends of the MF/UF module to hold them in place. Other designs allowed the feed, filtrate, and backwash to be collected at different points, and air was introduced at the base of the module, dislodging solids as it rose up through the fiber bundle. Now some manufacturers have introduced configurations where the top end of the fiber is sealed but is no longer potted in place. This allows the fibers to move freely within the module or cassette in a continuous motion that helps dislodge particulates from the membrane’s surfaces. This open configuration also allows aeration to penetrate deeper into the fiber bundle and release solids during air scouring. Another supplier developed an MBR system with submerged cassettes that gently rock back and forth in a reciprocal motion. The process claims to discourage deep particulate caking, keeping the foulant layer thin, so that longer treatment cycles can be achieved. Low energy, no aeration membrane bioreactors (LENA MBR) allow the fibers to move gently back and forth, and the resulting motion continuously shakes foulants off the membrane’s surface. 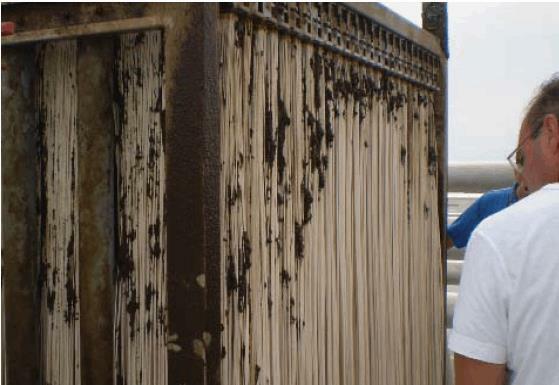 Sludge accumulation between the fibers is also minimized by the reciprocal motion of the cassettes and the pulsating fibers. Eliminating aeration reduces operating costs related to air scouring and recirculation of the streams. There are a number of demonstration plants in the U.S. that are using these operational and design technologies, and several full-sized plants should be installed in the near future, so we can all evaluate their efficacy and advantages. While only hollow fiber systems were specifically addressed here, both flat sheet and ceramic sheet membrane systems also use similar methods of minimizing the depth of solids buildup on membrane surfaces. As with hollow fiber membranes, surface air scouring helps extend the hours of operation and maintain an acceptable thickness of solids on the surface of flat sheet membranes. We’ve recently heard that small plastic balls are being added to the feedwaters of some tubular membrane systems to assist in the scouring process and help dislodge foulants. Adding an innocuous physical component to create turbulence is certainly an interesting concept and may be of value to future MBR developers. Microfiltration and ultrafiltration processes have proven to be extremely effective in removing solids from high-particulate waters and wastewaters. The ongoing challenge for system designers is developing effective ways to mitigate the accumulation of those same solids on membrane surfaces. As illustrated here, methods exist and continue to evolve, and there can be no doubt that achieving a competitive advantage in longer run times and reduced operational costs will ensure continued innovation. 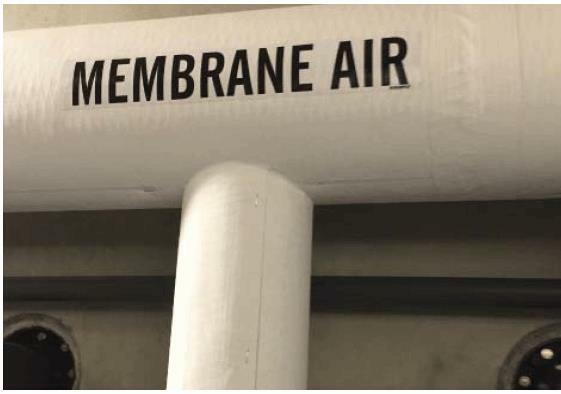 The American Membrane Technology Association (AMTA) has prepared membrane technical fact sheets on a variety of membrane and related technologies and applications including MBR, MF/UF, reverse osmosis, and more. AMTA fact sheets can be found at www.amtaorg.com. Harold G. Fravel, Jr. accepted the position of executive director for the American Membrane Technology Association (AMTA) after working for Dow Chemical /FilmTec Corporation for 36 years. He has a Ph.D. in organic chemistry from the University of North Carolina and a B.S. in chemistry from Florida State University. He resides in Jupiter, FL. Karen Lindsey is an executive member of the American Membrane Technology Association (AMTA) board of directors. She is the VP and co-founder of Avista Technologies and has 30 years’ experience in the water treatment industry, working with companies that cast cellulose acetate membrane, produced polyamide elements, and formulated specialty chemicals.